Our villa is ideal for summer as well as all year around holiday rental and offers a very high standard of accommodation. Purchased in the spring of 2008 it is redesigned throughout with no expense spared. We have employed one of the region's best known landscapers to redesign the garden and the pool. (Pool is unavailable Oct-March). Internally we have 2 beautiful bedrooms all with individual character. The kitchen has all modernities and there is also a marvelous dining room. The big and spacious living room has satellite TV with all English channels and a DVD. There is a beautiful 80 square meters terrace with a barbecue. The property enjoys a uniquely convenient location just 2 mins walk from the small village of Lezignan la Cebe with shops and furthermore just 25 min walking distance from 'Mollieres' Pezenas . Nearest airport via RyanAir in the spring ,summer and autumn is Beziers: a 20 minute and approx.50 euro taxi drive from Pezenas. In winter the closest airport is Montpellier. The property owner often uses Barcelona and their very cheap car rental oppurtunities. Rental enquirys for the season 2017 is open. A lot of bargains! Christmas and New Year Happy prices ! Make an enquiry for more details. This area around Pezenas is ONE OF THE MOST LUCRATIVE REGIONS IN THE WORLD , if you just want to relax and take it easy. For references ask anyone who´s been there...! Long term rentals are welcome. Ask for price. Reliable owners. The property has got a lot of space. It is surrounded by a wall with parking inside the gate. The house is modern and has got a big terrace with a barbecue. An safe area with good communications and the best climate in France. A lot of historical places in the area Fair pricing. The two bathrooms are elegant in style with toilet and enclosed showers. One on each floor. In the area , yes. Cosy winter retreat & summer paradise! We arrived at Lezignan la Cebe, in winter, for a three months stay. The spacious, house and garden, with private parking, had everything we needed. Thoughtful owners left a stack of firewood for the open fire, there was additional heating, stacks of linen, good Internet connection, the availability of bikes to use and a list of helpful people that was invaluable. The property is close to some of the best beaches in France, has the convenience of Pezenas, a large town with everything you might need, including a street of antique shops, a picture theatre and restaurants galore. In the village of Lezignan la Cebe, a chemist, boulangerie, mini-supermarket and a friendly mixed business, are a short walking distance away. In Languedoc-Rousillon we were living in the middle of the biggest vineyard in France and the the arrival gift of a local red and white was appreciated. Here we had more places of interest than any other region of France. With the Mediterranean on our doorstep, and Spain and Provence for neighbours, we had a very rich experience indeed. We recommend this home away from home as a cosy winter retreat or a summer paradise for a couple or a family. We appreciated you as our guests. And you are welcome back anytime in the future. We spent one week in this beautiful and huge villa in October 2010. Our family of two adults and two children with a big dog had a lot of place and everything we needed was there. The house is well-equipped and has a really nice garden. The pool is small, but has an alarm (if travelling with small children). On the ground floor there is a huge room including the kitchen with table and chairs, living-room and a big salon. There is also a bedroom, a bath-room and a small utility room.The second bedroom is on a mezzanine, open like a gallery with a small bathroom and the door to a very large patio with a barbecue. Everything was clean and you can feel the warm atmosphere the owners brought in this place. Pezenas is the nearest town (4 km) and very beautiful. Of course, October is low season and we had no chance of using the pool or swimming in the sea. Langedoc-Roussillon is a wonderful region and there are lots of possibilities for sightseeing. Lezignan la Cebe is a small village and you need a car there. This place is a nice and peaceful place to have a wonderful holiday. There is no internet access and you have the chance of a relaxing vacation. The ratio of price and benefit for the rental is really good. Our review is a 4,5 for this place. We will go there again but not in October. Thanks to the owners for the possibility of renting this property. We are trying as best as we can to give our guests full value of their recreation. Thank you very much for this really nice review. a wonderful place to be at! If you are looking for a long term rental between Nov-April , this is the place. We stayed in Erikk Fernstrom’s house in Lezignan La Cèbe for one week starting July 4th, 2009. It is a large and comfortable house, with a well-equipped kitchen. There are two shower rooms with WC (one on the ground floor and one on the mezzanine floor) which is very convenient. The room in the mezzanine is very pleasant, but needs curtains ! On the ground floor, there is a big salon and a big dining room, along with another bedroom. The garden is pleasant, in particular the area around the swimming pool, though the pool is a bit too small and does not make it possible to really swim. This house is very well located as it is near the Mediterranean sea, which means that the weather is very pleasant. Moreover, Lanquedoc-Roussillon is a wonderfull region in France with many sites to visit. Thank´s for the nice review. We are putting up curtains shortly. We spent a lovely week at this property in September. It's in a beautiful quiet location on the edge of a charming little village. It is very comfortably furnished with a shower room and bedroom on the ground floor so it is suitable for the disabled. The second bedroom is on the mezzanine floor together with a new shower room . There is access to the very large patio together with a built in barbecue from this floor. A real suntrap although I have some concerns about the fence at the front of this patio. It can be seen in the main photo of the front of the property. Although the description of the house says it has been completely refurbished the kitchen and downstairs shower room are not new but still function perfectly well. There is satellite T.V. which gives all UK channels. There is no DVD or CD player. The swimming pool is a plunge pool. The town of Pezenas is a real gem and it would be possible to spend a holiday without going any further afield. It is about 4 kilometres away and not really accessable by foot as the roads are busy and have no footpaths. There is a golf course at nearby Beziers . Page 322 BL87 of the Michelin book map. It is reached via Bessan and then along the D28. Don't try to reach it by driving off the N9 Beziers Pezenas road! Montpellier is certainly worth visiting together with Sete Palavas and Aigues Mortes. Boat trips around the Petit Camargue can be taken from here viewing the horses, bulls and flamingoes. We bought this property last summer. We ,the owners , is a Sweden based family that really enjoys the peace and warmth in this area. There are actually some small nice gravel roads leading into Pézenas from the property. So one does not need to follow the paved big road . It is however a good idea to use bicycles along these gravel roads . We stayed in the house with two adults and two children for two weeks. The house is lovely furnished and decorated and fully equipped. Very spacious and with a huge balcony. Eric, the owner, is very friendly and helpful. Thanks very much, we really enjoyed our stay. We really enjoyed having Anne Wegemar with family as our guests. 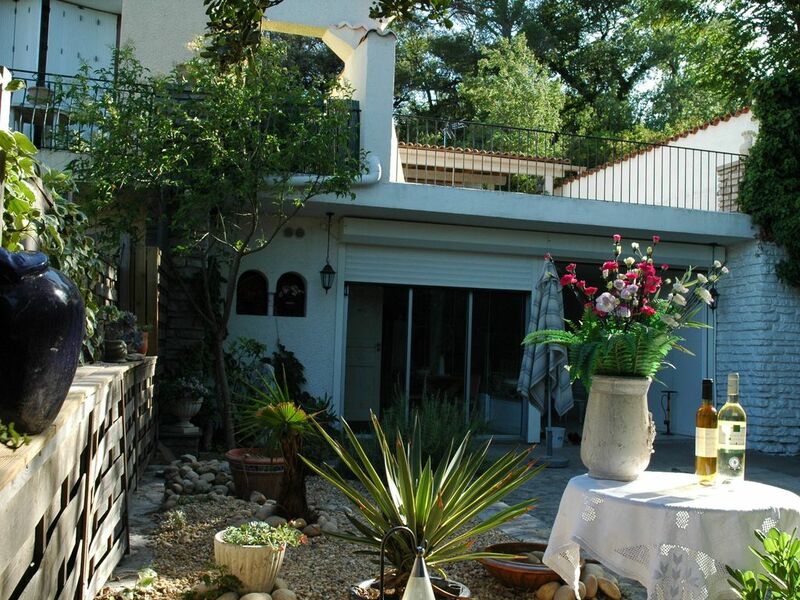 The house is situated in the village of Lezignan la Cebe , very close to Pezenas. It is an area perfect for families with children. There are restaurants, studios, bars, tea and coffee shops, galleries and a tourist office just a step away . A privat swimming pool with a walled garden, a terrace, a secure parking, a peaceful place of character and perfect location just outside Pezenas makes the house a perfect holiday home. Pezenas has an amazing range of restaurants, quality food, wine, and craft . Nearest airport all year round via RyanAir and BA is Montpellier: a 40 minute and 70 euro taxi drive from Pezenas. In the spring ,summer and autumn Beziers , just 20 km away , offers RyanAir. We are an hour from the walled city of Carcassonne and just a 10 min ride with bicycle to the historic village of Pezenas , where the french author and artist Molliere once lived. Other major attractions within easy reach are Sete and Agde on the coast, with their beaches and harbours, and the local Dinosaur site. Other Activities: The area holds most activities and this area is one of the most popular areas for tourists in the world. There are always rental discounts during low season from November to April / May. 680 Euro/week the last 3 weeks in October 2012 f.i. Long terms rentals welcome during okt-april every year. Ask for friendly price. Special rates during Christmas and New Year.